Corgi just like any other dog needs good training while it is still young to ensure a good relationship with the owner. Due to their highly intelligent nature, Corgi training is a piece of cake. The owner however needs to apply authority over the Corgi early in their relationship due to Corgis temperament with their tendency to herd over other animals and even humans. Corgis also suffer from small dog syndrome. 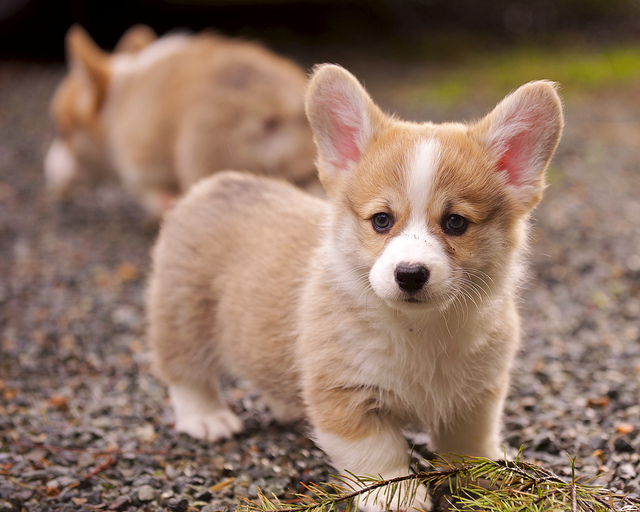 The first thing to train your Welsh Corgi puppy or your new adult Corgi is their daily routines. When a new Corgi comes to your home, you need to gently take them around and let them get acquainted with their new place. You need to let Corgi know where the food and water dishes are located as well as the bed. Your new Corgi will also need to be trained on the time that it is supposed to go to sleep and what time they need to wake up. However this is not something that can be achieved within the first couple of days; it usually takes at least a week for a daily routine to be established. You can also adopt a training collar as part of the Corgi’s training routine which has been proven to be an effective an quick way to assimilate commands. The next phase of your Corgi training is obedience. Obedience training is the basis of all other training procedures. The Corgi should perceive you as the leader and it should always respect you. You can begin by teaching them words such as “No” and “Stop” so that you can start understanding when a certain behavior is not appropriate. Corgis are quick learners and they tend to excel at obedience training when a firm but friendly approach is used. It feels right to reward your Corgi with a treat once they do well in training, but at the first stage, it’s not advisable. Let your Corgi understand that they need to obey you whether there is a treat or not. Corgis tend to gain weight easily so if you’d make it a habit to reward it with treats each time they do well, you might end up with an obese dog. Still on obedience training, you need to leash train your Corgi as soon as you get them at your home. Attach a leash to the puppy and walk with them outside. At first let them walk freely in whichever direction they want to. After a while, you can start leading your Corgi where you want it to go. Do not pull on the leash, gently pull them and soon enough, they will understand what you require of them. Try walking your Corgi on your left side, right next to you. As your Corgi puppy grows older, it is highly advisable for you to introduce the crate. The puppy crate is a secure place for them and where they can also get a much needed rest with minimal disruption. The crate also helps your Corgi get comfortable when travelling either to the vet or got to vacations together. You should never treat your Corgi as if the crate is a small jail for them, because very soon your little Corgi will discover this and it will often refuse getting in there. 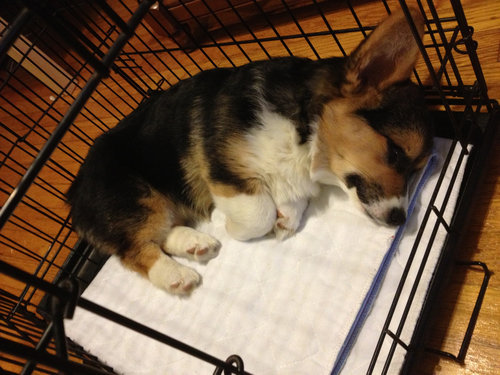 Get the Corgi puppy into the crate every once in a while. Let your Corgi understand that the crate is good for them as a resting place. The crate needs to be very comfortable, with sufficient beddings, good air flow and good amount of light getting through. Only when your Corgi is comfortable with his crate you will be able to take them around in your car visiting anywhere you want them to enjoy. Housebreaking training is absolutely important for your Welsh Corgi. When younger, the Corgi might be unable to have complete control over the bladder. At about three months old, they should be gaining more control and at this point you need to train them on where and when they need to go for their bathroom needs. Among all puppy trainings, potty training is the most challenging even for your smart Corgi. The owner or the trainer of Corgi needs to be equipped with a lot of patience. Just like in small children that wet their beds and later stop, so does your Corgi. You need to determine a schedule when your Corgi is fed as this will dictate when they need to go do their potty. Feed your Corgi at the same time daily in order for you to determine when then need to go to the bathroom. Have a designated “toilet” place within your house where you can order your puppy to go once you notice they want to relieve themselves. The toilet area should be preferably somewhere out of people’s view. This will also help you clean and detoxify it once your Corgi is through with their business. Potty training is one of the cases when you need to offer a treat once your Corgi gets it right. This reward will reinforce your Corgi’s good behavior and after a while you can gradually withdraw the treat. Other forms of training will be introduced as the Corgi gets older. These are mostly associated with its socialization with humans and other animals. Your Corgi needs to learn to accept being handled by strangers. You need to teach them to be gentle with humans. Discourage them from jumping on people or chasing cats around. Another very common behavior with Corgis is nipping at the heels of people. You should discourage them when they are still young. As Corgis being herding dogs, it is in their instinct to nip at heels. Make them understand that this kind of behavior is not acceptable at all, especially if you have small children in your home. When your Corgi behaves in a manner that is not appropriate, promptly let it know that it should not do it again. If your Corgi has some good obedience training and it respects you as a leader, it will get through most of the household training easily. You can also check some Dog Training Products which can become a great aid to your Corgi training.